Today, an increase in the number of elective surgeries and the still prevalent but small risk of transmission of blood-borne pathogens such as HIV have served as a stimulus to develop a synthetic substitute for human blood, more specifically for development of a red blood cell substitute. However, to date, no oxygen-carrying blood substitutes are approved for use by the US Food and Drug Administration. This fact highlights not only the challenges that exist in formulating an effective blood substitute but also the immense potential that exists in this field. One gram of adult hemoglobin binds to 1.39 milliliters of oxygen. The oxyhemoglobin dissociation curve (see the image below) has a characteristic sigmoid shape due to the cooperative effect that exists between the multiple oxygen binding sites on the hemoglobin molecule. Factors that modify the ability of hemoglobin to bind oxygen include body temperature, pH of blood and the concentration of 2,3-diphosphoglycerate (2,3-DPG). 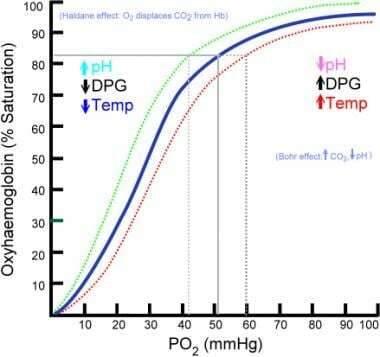 The oxyhemoglobin dissociation curve plots the proportion of hemoglobin in its saturated form on the vertical axis against the prevailing oxygen tension on the horizontal axis. Image courtesy of Wikimedia Commons. If such a blood substitute were indeed developed, it would presumably play a major role in the setting of trauma care and for elective surgeries. It would also benefit patients with medical conditions who are in need of long-term blood transfusions, such as patients with myelodysplastic syndrome and aplastic anemia. These products could also be used as organ preservatives to prevent or decrease reperfusion injury to donor organs. Religious and ethnic groups with concerns regarding the use of human derived blood products may accept these substances, which would provide a significant patient care advance. After intravenous administration, the droplets of this emulsion are taken up by the reticuloendothelial system and then slowly broken down. They are then transported to blood, where they are bound to lipids and move to the lungs. In the absence of significant in vivo metabolism, perfluorocarbons are removed from the body by exhalation. Perfluorocarbons demonstrate a linear oxygen dissociation curve in contrast to the sigmoid dissociation curve of blood. Hence, elevated arterial partial pressures of oxygen enhance oxygen transport by these molecules. However, this linear relationship can also work as a disadvantage since most of the oxygen is released prior to the arrival of the oxygen-laden molecule in the capillary network where the partial pressure of oxygen is lower, and hence the need for oxygen is greater. The first product to be marketed contained perfluorodecalin and perfluorotripropylamine emulsified with Pluronic F-68 and called Fluosol-DA. It was manufactured by the Green Cross Corporation (Japan) and Alpha Therapeutics (Grifols USA, Los Angeles, Calif). It was approved by the FDA for use in percutaneous transluminal coronary angioplasty. However, due to marginal efficacy, a short effective half-life, temperature instability, low oxygen-carrying capacity, and adverse effects such as acute complement activation and disruption of pulmonary surfactant, this product has since been withdrawn from the market. Stroma-free hemoglobin has been investigated as an oxygen carrier since the 1940s, when researchers realized that native hemoglobin is not antigeneic. A solution containing stroma-free hemoglobin has many advantages over red blood cells, including the ability to withstand sterilization and a shelf life of approximately 2 years at room temperature for some products. Solutions of acellular hemoglobin are not as effective at oxygenation as packed red blood cells because of their high affinity for oxygen. Red blood cells have adapted to release oxygen at an oxygen half saturation pressure of hemoglobin (p-50) of approximately 26.5 mm Hg. This is due to the allosteric effect of 2,3-bisphosphoglycerate (2,3-BPG), which shifts the oxyhemoglobin dissociation curve to the right. In the absence of 2,3-BPG, stroma-free hemoglobin has a p-50 of 12-14 mm Hg. Unmodified free hemoglobin, when infused rapidly, splits into dimers and is cleared by glomerular filtration and uptake by the reticuloendothelial system. When free hemoglobin was used initially, it caused a substantial increase in oncotic pressure because of its hyperosmolarity. Unfortunately, the initial attempts at transfusing stroma-free hemoglobin produced renal dysfunction, coagulopathy, and hypertension. Adverse effects were attenuated by various modifications to the hemoglobin molecule to prevent glomerular filtration and to stabilize the molecule to withstand heat and chemical purification during production. Hypertension induced by infusion of these products was out of proportion to the volume infused and has been more difficult to prevent. It is thought to result from hemoglobin binding to nitric oxide, which is a potent vascular endothelial relaxant. Several approaches have been tried to decrease the avidity with which hemoglobin binds to oxygen. These adaptations include the addition of organic phosphate to serve the function of 2,3-BPG and adenosine triphosphate, cross-linking dimers of hemoglobin tetramers and polymerizing the tetramers to decrease oncotic pressure and prevent glomerular filtration. Hypertension has remained a significant adverse effect of stroma-free hemoglobin. Diaspirin cross-linked hemoglobin (DCLHb) is the prototype molecule of this category of blood substitutes. It consists of cross-linking between the two alpha chains that lend stability to the molecule. The cross-linking agent is bis (dibromosalicyl) fumarate (DBBF). DCLHb made from outdated human blood has a shelf life of approximately 9 months when frozen and 24 hours when refrigerated. The intravascular half-life is 2-12 hours and is dose dependant. Clinical trials proved that this compound did indeed raise blood oxygen content. However, it also caused intense vasoconstriction resulting in increased systemic pressure, reduced cardiac output, and increased vascular resistance. Hence, no net benefit was derived from this product. The first recombinant hemoglobin product, rHb 1.1 (Optro, Somatogen and Eli Lilly) was a genetically engineered variant of human hemoglobin, Hemoglobin Presbyterian, with modifications to decrease its oxygen affinity. The product was produced in Escherichia coli and had an intravascular half-life of 2-19 hours and a shelf life of 18 months when refrigerated. The adverse effect profile was similar to DCLHb and consisted of vasoconstriction, GI distress, fever, chills, and backache. Currently, the production of this compound has been discontinued due to significant adverse effects. Similarly, rHb 2.0, a recombinant hemoglobin produced by Baxter Healthcare had an adverse safety profile that resulted in discontinuation of production. The development of polymerized hemoglobin was also a result of significant adverse effects caused by intravenous infusion of stroma-free hemoglobin. The cross-linking agent in this case was glutaraldehyde. However, it was discovered that the Hb-glutaraldehyde polymerization reaction was difficult to control and resulted in the formation of products of various molecular sizes. Northfield laboratories was involved in a 720-patient phase III trial in trauma patients in which subjects were randomized to receive either PolyHeme or standard of care at the time of injury. On reaching the hospital, patients in the control arm receive blood as indicated whereas patient in the PolyHeme arm continued to receive PolyHeme for 12 hours, and then received blood, as indicated. Preliminary results indicated that 46 of 349 patients treated with PolyHeme died, whereas 35 of 363 patients in the control group died. The difference in mortality between the 2 groups at 30 days was not significant. Therefore, the trial seemed to show that although PolyHeme was not inferior to standard of care, it was not superior to it either. Other first-generation polymerized hemoglobin products include HbOC-201  (Hemopure manufactured by Biopure Corporation, Cambridge, Mass) and HemoLink (Hemosol Corporation, Mississauga, Canada). Hemopure is a polymerized form of bovine hemoglobin with a p-50 of 30 mm Hg that is closer to human hemoglobin than stroma-free hemoglobin. It has an intravascular half-life of 8-23 hours and a shelf life of 36 months at room temperature. Hemopure is approved in South Africa for the treatment of adult surgical patients who are acutely anemic with the intention of eliminating or reducing the need for allogenic red blood cell transfusions. In the United States, phase II trials have been put on hold due to safety issues. In December 2006, the Blood Products Advisory Committee of the FDA voted against recommending that the US Navy proceed with late-phase clinical trials of Hemopure. The main reason for this was the adverse effect profile of this compound since previous studies had shown that Hemopure could increase the risk of strokes and myocardial infarction. Biopure is currently addressing the FDA's questions regarding safety and efficacy of the product. Polyethylene glycol (PEG) hemoglobin (Enzon Pharmaceuticals, Bridgewater, NJ) was a conjugated bovine hemoglobin that was evaluated for use in cancer therapy to increase tumor oxygenation and enhance the efficacy of radiation and chemotherapy. [12, 13] However, at present, production of this product has been discontinued. Hemospan (Sangart Inc., San Diego, Calif), also known as MP4OX, is a PEG-conjugated human hemoglobin currently undergoing clinical trials in the US and Europe. In animal models Hemospan (MP4OX) has been shown to be effective in cases of hemorrhagic shock. Adverse effects associated with the vasoactive properties of first-generation blood substitutes are not seen with Hemospan (MP4OX). At relatively low concentrations, Hemospan (MP4OX) is capable of transporting large amounts of oxygen. Sangart Inc. announced positive results from a phase II study for this product in November 2005. The trial, conducted in Sweden, involved 90 patients undergoing hip arthroplasty. Patients were randomized to receive either Hemospan (MP4OX) or Ringer acetate (control) before induction of spinal anesthesia. Hemospan (MP4OX) was found to be well tolerated in the study group with no serious adverse effects attributed to the product during the trial period. The percentage of hypotensive episodes in the Hemospan (MP4OX) group was about 45% compared to 87% among controls. Incidence of intra-operative vasopressor use was about 15% in the Hemospan (MP4OX) group compared to 32% among controls. See Sangart Inc: Clinical Trials for more information on recent studies. Pyridoxylated hemoglobin polyoxyethylene conjugate (PHP) is a conjugated hemoglobin developed by Apex Bioscience that completed a phase III trial in August 2009 in patients with shock associated with systemic inflammatory response syndrome. The study has been designed to evaluate the safety and efficacy of continuous IV infusion of PHP plus conventional vasopressor treatment versus continuous IV infusion of Plasma-lyte A plus conventional vasopressors as a treatment for restoring hemodynamic stability in SIRS patients with shock. See ClinicalTrials.gov, Identifier: NCT00021502, for more information. Efforts have been made to encapsulate hemoglobin within a lipid-membrane to create a compound capable of carrying oxygen while not being associated with significant vasoconstriction. These liposomes appear to be retained in plasma for a significant period. However, they are difficult to produce and can activate the reticuloendothelial system, the complement pathway, and platelets. At present, the only institutions working actively on this product are in Japan. Adverse effects associated with hemoglobin-based oxygen carriers include hypertension, abdominal pain, skin rash, diarrhea, jaundice, hemoglobinuria, oliguria, fever, stroke, and laboratory anomalies such as an elevation in lipase levels. Although most of these side effects were transient and clinically asymptomatic, many clinical trials involving these agents have been discontinued or held due to the associated adverse effects. Despite many years of research, the ideal blood substitute continues to elude researchers. Most of the initial attempts at synthesizing blood substitutes failed because of significant adverse effects. However, continued research has helped us better understand the physiology of red blood cells and the interactions of RBCs with their surrounding environment. This has helped in developing newer products that do not have significant vasoactive properties, as did the first-generation compounds. Hopefully, as better blood substitutes are developed and enter routine clinical use, the need for blood transfusions in the operative and trauma settings will decrease. Large-scale production of blood substitutes would also help to meet the anticipated increase in demand for blood as the population ages and the blood donor pool diminishes. What is the physiology of oxygen transport relevant to blood substitutes? What are the characteristics of an ideal blood substitute? What are potential uses of blood substitutes? What are the first-generation blood substitutes? What is efficacy of stroma-free hemoglobin as a blood substitute? What is efficacy of diaspirin cross-linked hemoglobin (DCLHb) as a blood substitute? What was the first recombinant hemoglobin blood substitute? What is the efficacy of polymerized hemoglobin blood substitutes? What are the next-generation blood substitutes? What are the adverse effects of blood substitutes? Why hasn&#39;t an ideal blood substitute been developed? Chen JY, Scerbo M, Kramer G. A review of blood substitutes: examining the history, clinical trial results, and ethics of hemoglobin-based oxygen carriers. Clinics (Sao Paulo). 2009. 64(8):803-13. [Medline]. [Full Text]. Keipert PE. Hemoglobin-Based Oxygen Carrier (HBOC) Development in Trauma: Previous Regulatory Challenges, Lessons Learned, and a Path Forward. Adv Exp Med Biol. 2017. 977:343-350. [Medline]. Moore EE, Johnson JL, Cheng AM, Masuno T, Banerjee A. Insights from studies of blood substitutes in trauma. Shock. 2005 Sep. 24(3):197-205. [Medline]. Spahn DR. Blood substitutes. Artificial oxygen carriers: perfluorocarbon emulsions. Crit Care. 1999. 3(5):R93-7. [Medline]. Johnson JL, Dolezal MC, Kerschen A, Matsunaga TO, Unger EC. In vitro comparison of dodecafluoropentane (DDFP), perfluorodecalin (PFD), and perfluoroctylbromide (PFOB) in the facilitation of oxygen exchange. Artif Cells Blood Substit Immobil Biotechnol. 2009. 37(4):156-62. [Medline]. Keipert P. Oxygent, a perfluorochemical-based oxygen therapeutic for surgical patients. Winslow R, ed. Blood Substitutes. London: Elsevier Inc; 2006. 312-323. Winslow RM. Current status of oxygen carriers ('blood substitutes'): 2006. Vox Sang. 2006 Aug. 91(2):102-10. [Medline]. Carson JL, Noveck H, Berlin JA, Gould SA. Mortality and morbidity in patients with very low postoperative Hb levels who decline blood transfusion. Transfusion. 2002 Jul. 42(7):812-8. [Medline]. Korte EA, Pozzi N, Wardrip N, Ayyoubi MT, Jortani SA. Analytical interference of HBOC-201 (Hemopure, a synthetic hemoglobin-based oxygen carrier) on four common clinical chemistry platforms. Clin Chim Acta. 2018 Mar 23. 482:33-39. [Medline]. Van Hemelrijck J, Levien LJ, Veeckman L, Pitman A, Zafirelis Z, Standl T. A safety and efficacy evaluation of hemoglobin-based oxygen carrier HBOC-201 in a randomized, multicenter red blood cell controlled trial in noncardiac surgery patients. Anesth Analg. 2014 Oct. 119(4):766-76. [Medline]. Dubé GP, Pitman AN, Mackenzie CF. Relative Efficacies of HBOC-201 and Polyheme to Increase Oxygen Transport Compared to Blood and Crystalloids. "2017 Military Supplement". Shock. 2017 Nov 14. [Medline]. Wang Y, Wang L, Yu W, Gao D, You G, Li P, et al. A PEGylated bovine hemoglobin as a potent hemoglobin-based oxygen carrier. Biotechnol Prog. 2017 Jan. 33 (1):252-260. [Medline]. Webster KD, Dahhan D, Otto AM, Frosti CL, Dean WL, Chaires JB, et al. "Inside-Out" PEGylation of Bovine β-Cross-Linked Hemoglobin. Artif Organs. 2017 Apr. 41 (4):351-358. [Medline]. Vandegriff KD, Malavalli A, Wooldridge J, Lohman J, Winslow RM. MP4, a new nonvasoactive PEG-Hb conjugate. Transfusion. 2003 Apr. 43(4):509-16. [Medline]. Young MA, Riddez L, Kjellström BT, Bursell J, Winslow F, Lohman J. MalPEG-hemoglobin (MP4) improves hemodynamics, acid-base status, and survival after uncontrolled hemorrhage in anesthetized swine. Crit Care Med. 2005 Aug. 33(8):1794-804. [Medline]. Chang TM. Blood substitutes based on nanobiotechnology. Trends Biotechnol. 2006 Aug. 24(8):372-7. [Medline]. Buehler PW, Zhou Y, Cabrales P, et al. Synthesis, biophysical properties and pharmacokinetics of ultrahigh molecular weight tense and relaxed state polymerized bovine hemoglobins. Biomaterials. 2010 Feb 9. epub ahead of print. [Medline]. [Full Text]. Cohn SM. Blood substitutes in surgery. Surgery. 2000 Jun. 127(6):599-602. [Medline]. Cohn SM. Is blood obsolete?. J Trauma. 1997 Apr. 42(4):730-2. [Medline]. Creteur J, Sibbald W, Vincent JL. Hemoglobin solutions--not just red blood cell substitutes. Crit Care Med. 2000 Aug. 28(8):3025-34. [Medline]. Frietsch T, Lenz C, Waschke KF. Artificial oxygen carriers. Eur J Anaesthesiol. 1998 Sep. 15(5):571-84. [Medline]. Goodnough LT, Scott MG, Monk TG. Oxygen carriers as blood substitutes. Past, present, and future. Clin Orthop. 1998 Dec. (357):89-100. [Medline]. Gould SA, Moore EE, Hoyt DB, et al. The first randomized trial of human polymerized hemoglobin as a blood substitute in acute trauma and emergent surgery. J Am Coll Surg. 1998 Aug. 187(2):113-20; discussion 120-2. [Medline]. Gulati A, Barve A, Sen AP. Pharmacology of hemoglobin therapeutics. J Lab Clin Med. 1999 Feb. 133(2):112-9. [Medline]. Henry S, Scalea TM. Resuscitation in the new millennium. Surg Clin North Am. 1999 Dec. 79(6):1259-67, viii. [Medline]. Hess JR. Blood substitutes. Semin Hematol. 1996 Oct. 33(4):369-78. [Medline]. Hughes GS Jr, Antal EJ, Locker PK. Physiology and pharmacokinetics of a novel hemoglobin-based oxygen carrier in humans. Crit Care Med. 1996 May. 24(5):756-64. [Medline]. Ketcham EM, Cairns CB. Hemoglobin-based oxygen carriers: development and clinical potential. Ann Emerg Med. 1999 Mar. 33(3):326-37. [Medline]. Klein HG. How safe is blood, really?. Biologicals. 2010 Jan 13. epub ahead of print. [Medline]. LaMuraglia GM, O'Hara PJ, Baker WH. The reduction of the allogenic transfusion requirement in aortic surgery with a hemoglobin-based solution. J Vasc Surg. 2000 Feb. 31(2):299-308. [Medline]. Lamy ML, Daily EK, Brichant JF. Randomized trial of diaspirin cross-linked hemoglobin solution as an alternative to blood transfusion after cardiac surgery. The DCLHb Cardiac Surgery Trial Collaborative Group. Anesthesiology. 2000 Mar. 92(3):646-56. [Medline]. Lee J, Kim JG, Mahon S, et al. Broadband diffuse optical spectroscopy assessment of hemorrhage- and hemoglobin-based blood substitute resuscitation. J Biomed Opt. 2009 Jul-Aug. 14(4):044027. [Medline]. Mullon J, Giacoppe G, Clagett C, et al. Transfusions of polymerized bovine hemoglobin in a patient with severe autoimmune hemolytic anemia. N Engl J Med. 2000 Jun 1. 342(22):1638-43. [Medline]. Patel MJ, Webb EJ, Shelbourn TE. Absence of immunogenicity of diaspirin cross-linked hemoglobin in humans. Blood. 1998 Jan 15. 91(2):710-6. [Medline]. Przybelski RJ, Daily EK, Kisicki JC. Phase I study of the safety and pharmacologic effects of diaspirin cross-linked hemoglobin solution. Crit Care Med. 1996 Dec. 24(12):1993-2000. [Medline]. Rabinovici R, Rudolph AS, Vernick J, et al. A new salutary resuscitative fluid: liposome encapsulated hemoglobin/hypertonic saline solution. J Trauma. 1993 Jul. 35(1):121-6; discussion 126-7. [Medline]. Reeder BJ. The redox activity of hemoglobins: From physiological functions to pathological mechanisms. Antioxid Redox Signal. 2010 Feb 21. epub ahead of print. [Medline]. Saxena R, Wijnhoud AD, Carton H. Controlled safety study of a hemoglobin-based oxygen carrier, DCLHb, in acute ischemic stroke. Stroke. 1999 May. 30(5):993-6. [Medline]. Scott MG, Kucik DF, Goodnough LT. Blood substitutes: evolution and future applications. Clin Chem. 1997 Sep. 43(9):1724-31. [Medline]. Sloan EP, Koenigsberg M, Gens D. Diaspirin cross-linked hemoglobin (DCLHb) in the treatment of severe traumatic hemorrhagic shock: a randomized controlled efficacy trial. JAMA. 1999 Nov 17. 282(19):1857-64. [Medline]. Spahn DR, van Brempt R, Theilmeier G, et al. Perflubron emulsion delays blood transfusions in orthopedic surgery. European Perflubron Emulsion Study Group. Anesthesiology. 1999 Nov. 91(5):1195-208. [Medline]. Viele MK, Weiskopf RB, Fisher D. Recombinant human hemoglobin does not affect renal function in humans: analysis of safety and pharmacokinetics. Anesthesiology. 1997 Apr. 86(4):848-58. [Medline]. Yu B, Bloch KD, Zapol WM. Hemoglobin-based red blood cell substitutes and nitric oxide. Trends Cardiovasc Med. 2009 Apr. 19(3):103-7. [Medline]. [Full Text]. The authors and editors of eMedicine gratefully acknowledge the contributions of previous authors Arun Rajan, MD, Raquel R Bartz, MD, Robert Przybelski, MD, Douglas Coursin, MD, and Eliot C Williams, MD, PhD, to the development and writing of this article.